I know, another documentary romanticizing the 1960s. 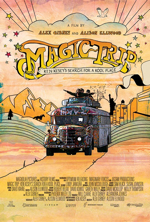 But Alison Ellwood and Alex Gibney’s “Magic Trip: Ken Kesey’s Search for a Kool Place” is worthwhile if you’re a fan of the author/hippie icon and the legend of his Merry Pranksters and you want to check out never-before-seen footage of their 1964 cross-country trip in the famous psychedelic bus (“Furthur”). It’s kind of like an illustrative supplement to Tom Wolfe’s “The Electric Kool-Aid Acid Test.” Not that you needed one. But who wouldn’t like to watch home movies made by their favorite literary characters, real and fiction? So check out the trailer at iTunes, where you’ll also be able to rent the film beginning July 1. That’s a whole month before it hits theaters on August 5.